The party conventions of 1896 set the tone for one of the most exciting political campaigns in American history. Meeting in St. Louis in June, the Republicans drafted a platform calling for high tariffs, a large navy, the annexation of Hawaii, and independence for Cuba, but the delegates were most interested in the currency plank. Declaring the party to be "unreservedly for sound money," the plank opposed bimetallism "except by international agreement with the leading commercial nations of the earth." McKinley could endorse the phrasing without reservation, but the prosilver faction of the party sought less equivocal wording. When they did not get it, they departed the hall, leaving the convention united behind the gold standard and free to proceed with the nomination of candidates. The people, thundered Ohio Senator Joseph B. Foraker in steamy St. Louis, wanted something more than a good businessman or fearless leader; they wanted "the exact opposite of the present free-trade, deficit-making, bond-issuing, laborsaving Democratic administration." In short, they wanted McKinley, and the convention nominated him on the first ballot. Soon after the Republicans had chosen their candidate, the Democrats selected Willam Jennings Bryan at a stormy convention in Chicago. Nominated on a platform that contained a demand for the free and unlimited coinage of silver as its most important plank, Bryan became the standard-bearer of the Populist party as well. The ensuing campaign developed into one that provided abundant material for a study in contrasts. Determined to take his cause to the people, Bryan traveled eighteen thousand miles, delivering six hundred speeches to an estimated 5 million persons. McKinley remained at home in Canton to greet and talk informally with a series of delegations brought in by the Republican campaign committee. As McKinley's campaign manager, Hanna was as untiring as the itinerant Bryan. With the help of a well-staffed speakers' bureau, he made sure that voters heard all the arguments for gold. Identifying McKinley as "the advance agent of prosperity," Republican orators addressed sympathetic audiences of voters dissatisfied with business stagnation and unemployment. Bryan, the Democrats, and the Populists found themselves constantly on the defensive as they sought to clarify the intricacies and the importance of monetary policy. In general, the campaign for silver attracted farmers seeking higher crop prices, but urban workers and ethnic groups that had traditionally supported the Democratic party could not be persuaded that they had much to gain from bimetallism. Nothing in McKinley's campaign alienated ethnic blocs; nothing he said to workers seemed so divorced from realities of the depression as did Bryan's plea for silver. Neither did McKinley neglect the farmers. His kindly nature, his imperturbable nationalism, and his long experience in Ohio politics had produced a broker politician of consummate skill. McKinley did not offer a new heaven and a new earth, but as his campaign pronouncements indicate, he at least offered hope for every interest group in a troubled society. "The farmer is suffering today because the number of his competitors has increased and his best customers are out of work," he told a delegation of farmers. Raising tariff rates would reduce competition and set factories to operating again. Everyone would benefit. "You don't get customers through the mint; you get them through the factory" was his refrain. For a delegation of Pennsylvania coal miners, he summed up his argument against silver: "We do not want cheap money, any more than we want cheap labor in the United States." 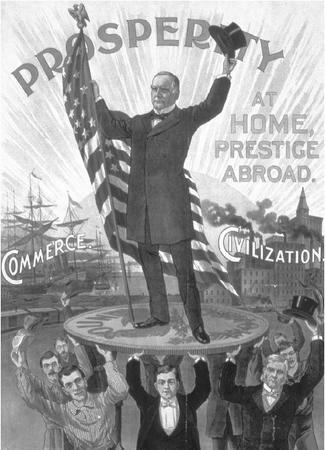 A campaign poster trumpets the candidacy of William McKinley, emphasizing a prosperous economy and strength abroad. development. Three-fourths of American industry centered in the manufacturing belt east of the Mississippi River and north of the Ohio River and Mason-Dixon Line, where three-fourths of the manufacturing wage earners lived. It was in this region that McKinley won the election. He captured all of its electoral votes as well as those of the upper South (Delaware, Maryland, West Virginia, and all but one in Kentucky), those of rural states in the upper Middle West (Iowa, Minnesota, and North Dakota), and those of Oregon and California.